The release of HQ Chowdhury’s Incomparable Sachin Dev Burman and Manek Premchand’s Yesterday’s Melodies Today’s Memories offered the apt forum for santoor exponent Padma Vibhushan Pandit Shiv Kumar Sharma to fondly recount his own personal experiences with Burman Dada. They worked together on many of Burman Dada’s compositions with Shivji playing the santoor in many of his songs. Addressing the audience at the packed Bhavan Auditorium at Chowpatty, Mumbai, Pandit Shiv Kumar Sharma recalled wonderful instances that reflected many shades of Burman Dada’s personality, his sense of humour and a deep passion towards his music. “Ameen Sayani has taken us back to the last century. We used to be in college and would wait for Binaca Geetmala, wondering which song would come on the pehli paydaan today. I know you since then,” began Shiv ji, paying his respects to the iconic Ameen Sayani, an honourable guest at the event. In the video below, watch from 24:30. “One day he called me, Shiv, kya kar raha hai? I said, I am at home Dada, tell me. He said, come quickly. I asked if everything was ok. He said, I have made a tune. I have a feeling its betaal (out of tune) but Meera says its ok. You come and listen. One day Dada had asked me to come for a sitting. My wife and her aunt had to go for some shopping on Linking Road and she asked me to drop her there. I thought of parking inside the Jet. Dada was sitting in the balcony. He saw me and two ladies getting out of the car. ‘Shiv, aaj ka sitting cancel ho gaya hai.’ He thought the ladies would come and listen to his music. The moment I told him they are going for shopping, he said, ‘achchha, tu upar aa ja.’ He was very secretive about his music. One day Dada was singing for us a song that had been recorded. It was a beautiful song. His servant came and announced that Shakti Samanta was waiting downstairs. ‘Shakti eshe gechhe? Bondo kore dao,’ he said immediately. (Shakti has come? Shut the music immediately) He thought if Shakti Samanta heard the tune, he would ask him to make a similar song for him. He had his unique ways. But one thing I must tell you, his knowledge and training in classical music was deep. He would tell us all kinds of stories of the mehfils. Ustad Abdul Karim Khan, the father of the Kirana Gharana, he would say, before he started singing, two tanpuras are playing, for 10 minutes and when he would start with the ‘sa’, the voice and the tanpura would merge seamlessly. Dada had a great sense of humour, although people think he was always a serious person. About Ustad Faiyyaz Khan, Dada told us an incident which perhaps has not been published earlier. Once, in Calcutta, there was a congregation of all the Ustads. KL Saigal used to live in Calcutta and in those days his song Babul mora naihar chhuto hi jaaye had become a huge hit, a thumri which had been made famous originally by Ustad Faiyaz Khan who used to sing it often. It was decided that Ustad Faiyaz Khan would tie the ‘ganda’ on Saigal to make him his disciple formally (ganda was a ritual tying of a thread to initiate a person as a disciple). Ustad Faiyaz Khan said, first I want Saigal to come in alone and I will explain a few things to him. They had also asked for a bottle (of whiskey). Almost an hour went by as Dada and others kept waiting outside for the ritual to begin. Finally, they quietly pushed open the door a bit and found that the bottle was now empty. Aur Saigal Sahab keh rahe hain ki aap mere ustad ho, aur Faiyaz Khan Sahab keh rahe hain nahin, tu mera ustad hai.” (Saigal was insisting that Ustad Faiyaz Khan was his ustad while Faiyaz Khan was emphasizing that Saigal was the ustad since he had sung the song so well). 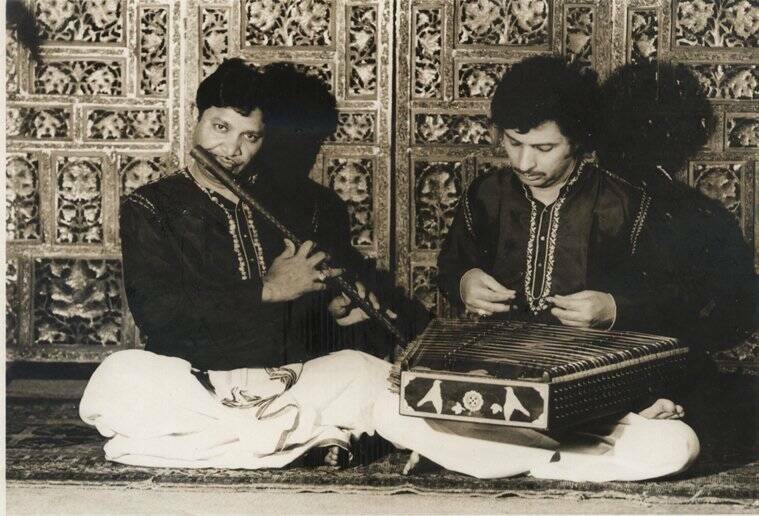 Pandit Shiv Kumar Sharma’s reminiscences brought alive the era when the legendary music makers reveled in the creation of music, alongside honing talents who went on to become legends themselves. (Tere Ghar Ke Samne, 1963) S D Burman / Hasrat Jaipuri / Mohd Rafi. (Munimji, 1955) S D Burman / Sahir Ludhianvi / Lata Mangeshkar. (Funtoosh, 1956) S D Burman / Sahir Ludhianvi / Kishore Kumar and Asha Bhosle. (Jewel Thief, 1967) S D Burman / Shailendra / Lata Mangeshkar. (Manzil, 1960) S D Burman / Majrooh Sultanpuri / Geeta Dutt and Mohammad Rafi. (Abhimaan, 1973) S D Burman / Majrooh Sultanpuri / Lata Mangeshkar..
(Pyaasa, 1957) S D Burman / Sahir / Geeta Dutt. (Tere Mere Sapne, 1971) S D Burman / Neeraj / Lata Mangeshkar and Kishore Kumar. (Guide, 1965) S D Burman / Shailendra / Lata Mangeshkar. (Naujawan, 1951) S D Burman / Sahir / Lata Mangeshkar. (Baazi, 1951) S D Burman / Sahir / Geeta Roy and Chorus.